Get there: Take Route 27 to Napeague Harbor Road and the entrance of Hither Hills State Park. Get there: Take 495 to exit 71. At the traffic circle in Riverhead, take County Road 63 (the first road off the right) and drive about a mile to the County Park parking area. Get there: Take the South Ferry from North Haven to Shelter Island and follow Route 114 one mile north to the preserve. Get there: From Route 27, take exit 64 South and head south on Route 104. Go two miles and turn right onto Old Country Road. Get there: From East Hampton, take County Road 40 and Springy Banks Road north to Alewife Brook Road, which will lead you to the park entrance. Get there: Take Route 27 to South Emery Street in Montauk and continue onto Surfside Avenue. The park is located at 900 Montauk Highway. Get there: From Route 27, take the Bridgehampton-Sag Harbor Turnpike north. The entrance is on the right, just past the turnoff for Channing Daughters Winery. 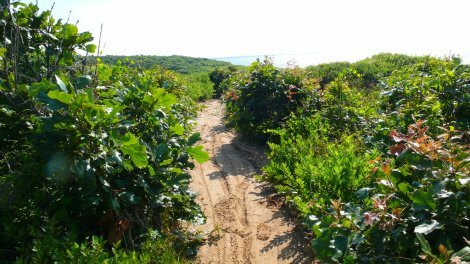 Subject: LongIsland.com - Your Name sent you Article details of "Check Out These East End Hiking Trails"